Cano was personable as always, contrite when talking about his mistakes, giddy about how the Mariners are playing in his absence and hopeful when talking about a chance to contribute to the team when he's eligible to return on August 14. The large pictures on the wall stared down ominously at Robinson Cano as he walked into the room, accompanied by Mariners chairman John Stanton. In “The Legends” conference room in the upper levels of the Mariners’ offices at Safeco Field, photos of the organization’s hall of famers are adorned prominently. It wasn’t that long ago, roughly two months, where it was possible to envision a photo of Cano flashing that high-wattage smile someday joining the likes of Ken Griffey Jr., Edgar Martinez, Dave Niehaus and more on that wall. Well, the simple fact that he was there, in street clothes and meeting with local media for the first time since being suspended for 80 games for violating the Major League Baseball joint drug testing policy makes that scenario seem unlikely. His legacy as one of the most productive second baseman in MLB history is now tarnished. Seated at the table, rubbing his surgically repaired right hand that still showed minor swelling from a procedure in early May, Cano was personable as always, contrite when talking about his mistakes, giddy about how the Mariners are playing in his absence and hopeful when talking about a chance to contribute to the team when he’s eligible to return on August 14. That easy trademark smile came back a few times during the 20-minute interview that wasn’t allowed to be publicly broadcast in video or audio format. While it wasn’t forced, it was obvious that the situation, his embarrassment and failure had drained some of the energy and joy from it and him. His hands shook as he unfolded a piece of paper with typed out words and handwritten notes scribbled in red and black ink. “I want to read some stuff that I wrote down so I don’t forget,” he said. “The city of Seattle has become my second home for my family and I. I’m grateful to the organization, my teammates and the fans and as you guys know, I’ve been getting tested for the last 12 seasons and I’ve never had an issue with MLB policy. I was being treated for some medical ailments and I was being supervised by a doctor. But at the same time, I understand that everything that goes into my body, I’m responsible for that. 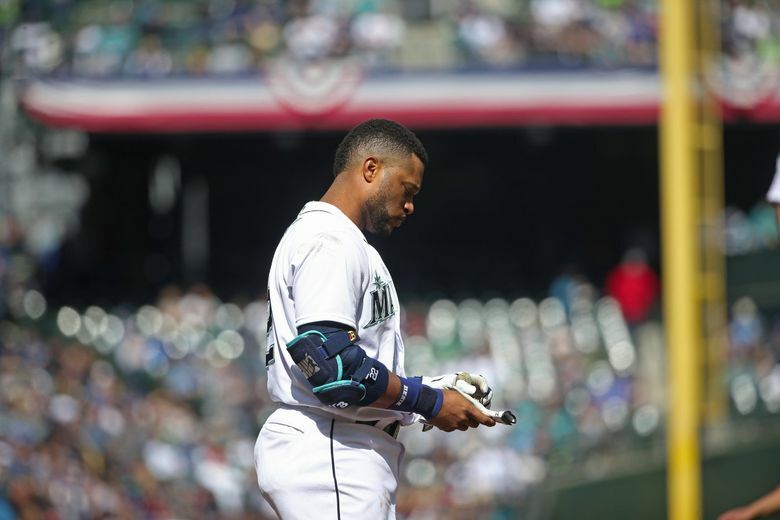 Officially, Cano tested positive for Furosemide during the offseason. It isn’t a performance-enhancing drug, but a diuretic that masks the effects of performance-enhancing drugs. After an investigation by the testing agency and Major League Baseball, the positive test was upheld and a suspension was levied. Cano appealed the suspension, claiming that drug was prescribed for high blood pressure, but then dropped the appeal just a few days before suffering a broken hand in a game in Detroit on May 13. His suspension was announced two days later. Since then, he’s been reduced to morning workouts at Safeco, an hour or two with his teammates and then exiled from the building once baseball activity begins. He watches every game from home. None of Cano’s teammates were aware of what was going on with him until the day the suspension was announced on May 15. The announcement of his suspension was a gut-punch to teammates, leaving some angry, others disappointed and all of them stunned. He knew he had to stand in front of all them and ask for forgiveness. Days later, players like Felix Hernandez were wearing Cano hats in the clubhouse to show their solidarity with him. It meant something to him. But some of his former teammates in New York, like Mark Teixeira, were not on his side, accusing him of past PED usage. Even Yankees general manager Brian Cashman offered similar hints. It wasn’t just former teammates, but former opponents like Frank Thomas and Michael Young, who said that everything Cano has done in his career is now in question because of the positive test. But he can control the message to others about his situation. The plan for Cano is to fly to the Dominican Republic in the coming days. He’s been working out at Safeco Field every day at 10 a.m., but he wants to increase his workload. He can do that by going to his father’s baseball academy. His commitment to preparation is for one reason. But how will he do it? There’s been much discussion about Dee Gordon’s success at second base since Cano’s suspension. And there is the looming issue of Cano being ineligible for the postseason. Would he be amenable to playing a different position on occasion to give Gordon requisite reps at second base? Is he worried that his return will mess up the team’s chemistry or success?